Opposition leader Morgan Tsvangirai has given his strongest hint to date that he may be grooming his youngest deputy, Nelson Chamisa, to succeed him in the MDC — after he gave the youthful politician the crucial task of leading the party’s selection process of parliamentary and council candidates for this year’s crunch elections. This is apart from Tsvangirai having also significantly chosen Chamisa to stand in for him and to handle all the party’s business within the MDC Alliance — as the former prime minister in the government of national unity valiantly battles colon cancer. The promising alliance is anchored around the spirit of the original Movement for Democratic Change ahead of this year’s crucial polls, supported by a number of other fringe opposition parties. But both insiders and political analysts who spoke to the Daily News at the weekend sounded a word of caution that any further moves by Tsvangirai to affirm Chamisa further at the expense of his other two deputies — Thokozani Khupe and Elias Mudzuri — could rip the MDC apart. Tsvangirai is frequently out of the country receiving treatment for his illness, which has limited his public appearances and his ability to directly steer his party. Well-placed sources revealed yesterday that Tsvangirai had called Chamisa to his residence before his latest departure to South Africa on Friday for his treatment, to appoint him to lead the MDC’s selection of its candidates for the fast-approaching harmonised elections this year. This was apparently done in the absence of both Khupe and Mudzuri — with the former having previously and vociferously voiced her concern over the manner in which Tsvangirai and the MDC have handled the formation of the Alliance. MDC secretary-general Douglas Mwonzora played down fears of looming leadership problems within the party, while confirming that party executive members would soon be meeting with Chamisa over the matter. “We are going to meet with VP Chamisa on Tuesday to deliberate on the issue of candidates’ selection. “The selection will be done according to the key MDC statutes and after that meeting with the VP, we will convene a national directorate meeting that will be chaired by the national chairperson Lovemore Moyo to approve the selected candidates,” Mwonzora told the Daily News. MDC Alliance spokesperson Welshman Ncube also confirmed to the Daily News yesterday that Chamisa would lead Tsvangirai’s campaign rallies ahead of the elections. “If we are going to have MDC Alliance rallies Chamisa is going to represent Tsvangirai,” Ncube said adding that it is not a new development because “in the last three months Chamisa was representing Tsvangirai at MDC Alliance principal meetings”. Ncube also told the Daily News that Tsvangirai had instructed Chamisa to oversee the selection of his MDC party’s parliamentary and council elections candidates. He further revealed that Tsvangirai had also insisted on Chamisa being present at a meeting that he had had with the former PM before the latter departed for his medical checkup in Johannesburg. “I had a meeting with president Tsvangirai. He said he needed a few weeks to focus on his treatment and during my meeting with him he then said it was important for Chamisa to be there. “I then called Chamisa and he came. Tsvangirai then told me that he had assigned Chamisa as his representative in the Alliance. “We agreed that all parties in the MDC Alliance should start their candidate selection processes to represent the Alliance in the next election ... the selection of MDC candidates should be completed by February,” Ncube said. University of Zimbabwe political science lecturer Eldred Masunungure said it was becoming increasingly clear that Tsvangirai was likely grooming Chamisa as his successor. “There appears to be a clear preference for Chamisa when one considers that he has been given the most important tasks to oversee. 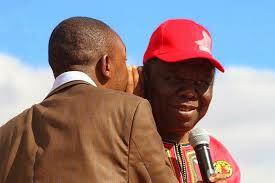 It shows Tsvangirai trusts him. “However, it is almost certain that it will be a divisive decision to hand over power to Chamisa given that Khupe is senior and a product of congress. “Tsvangirai did not want to be seen to be undermining the authority of his two other deputies when he gave them areas of responsibility but ... I don’t think that is the right governance model ... we all know the acrimonious relationship between Tsvangirai and Khupe over the Alliance issue,” Masunungure said. The MDC Alliance includes the People’s Democratic Party (PDP) led by Tendai Biti; Ncube’s MDC; Transform Zimbabwe of Jacob Ngarivhume; Zanu Ndonga headed by Denford Masiyarira; and the Multi-Racial Christian Democrats led by Mathias Guchutu. Tsvangirai is calling all the shots within the MDC Alliance so much so that no one outside his party can take over from him in the event that he dies or gets incapacitated before this year’s polls. “In the event of a vacancy occurring for the presidency for whatever reasons before the election, then the Alliance partners shall select another candidate and if such vacancy occurs after election then the provisions of the national Constitution shall apply,” reads part of the Alliance’s Cooperation Agreement. In terms of the supreme law of the land, the governing party has the prerogative of appointing a successor should it happen that a serving president dies or gets incapacitated while in office. What this entails, therefore, is that the MDC would still select Tsvangirai’s successor in the event that he exits office for whatever reasons after winning the 2018 polls. Observers say the former prime minister’s poor health could potentially result in a deadly succession race in the MDC. MDC insiders also said in the event that Tsvangirai was not fit to campaign and lead both the Alliance and his party, the MDC would not hold an extraordinary congress to choose his successor. “The president wants to continue because he hopes he will recover in time for the campaign. But in the event that he fails, the talk of an extraordinary congress is far-fetched.